The Thermoforming process has many advantages over other types of molding. Most commonly it is compared to the injection molding process. While both processes can be used for a large number of applications, there are several considerable differences between the two processes. Injection molding has its limitations when it comes to size of product and cost of tooling. A typical injection mold tool will cost roughly 33% more than a similar thermoformed tool, and the margin increases as the parts get larger. Injection molding does not offer a good prototype process. 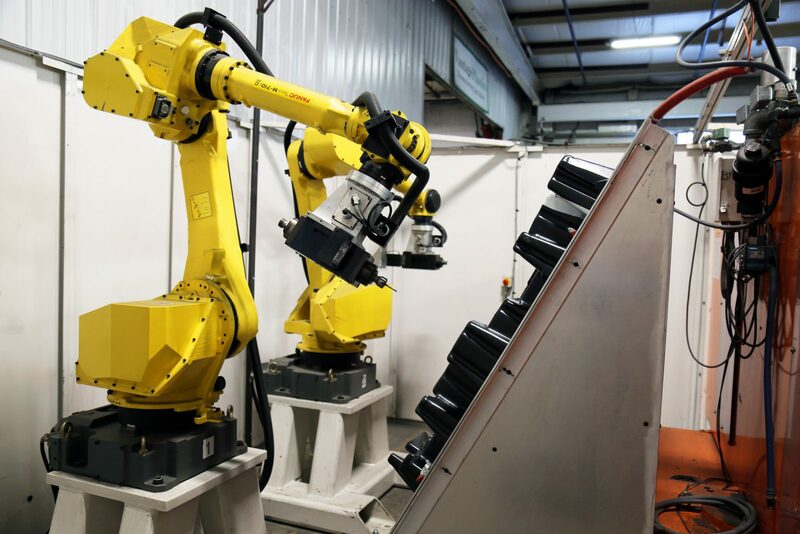 Typically, SLA or SLS parts are used for prototyping, which offer limited comparisons to the actual final product, can be expensive, and are not of the same material the final product will be made from. Thermoforming, on the other hand, utilizes a prototype tool made from wood or epoxy that can be used to create several finished parts that truly represent the final product. The prototype is also formed from the same material as what the final product will be made from. Therefore, many possible design or fit issues can be caught up front before going to production tooling, thus saving time and money. When it comes to large parts, thermoforming wins hands down. From cost for both tooling and parts there is little comparison. 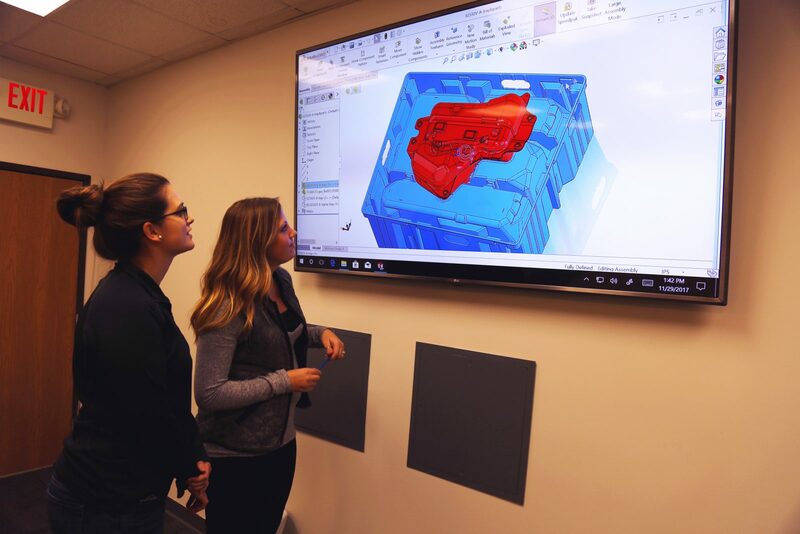 For instance, a typical 45”x48” part would have tooling at roughly half the cost of a comparable injection mold and the piece price is generally less as well, depending on material choice. Twin sheet thermoforming is the process of bringing two thermoformed sheets together to make one part. This is accomplished by heating two sheets of plastic and pressing them together with two separate molds using platens, thus creating a mechanical bond between the two sheets. The process is very similar to thermoforming a single sheet with an added step. The initial sheet is placed into the clamp frames and rotated into a large oven. The sheet is pre-heated in the first oven and then rotated around the second oven to finish bringing it up to the forming temperature. While this is happening, the second sheet has entered the first oven and is being heated to near the forming temperature. At a given point the carousel rotates and the first sheet is brought to one of the molds and is formed onto this tool. Meanwhile, the second sheet has entered the second oven and is finished being brought up to forming temperature. At this time the clamp frame releases from the first sheet leaving the sheet on the mold, the carousel rotates, and the second sheet is brought around to the second mold on the top platen. Finally, the top platen is lowered, takes vacuum, the sheet forms around the mold, and then the platens are brought together and locked to create a bond between both sheets. This process can be used to fulfill a large number of applications, from pallets to trays to consumer goods products. It is a rather unique process and requires special machines to perform the task, but the outcome can create very unique parts. 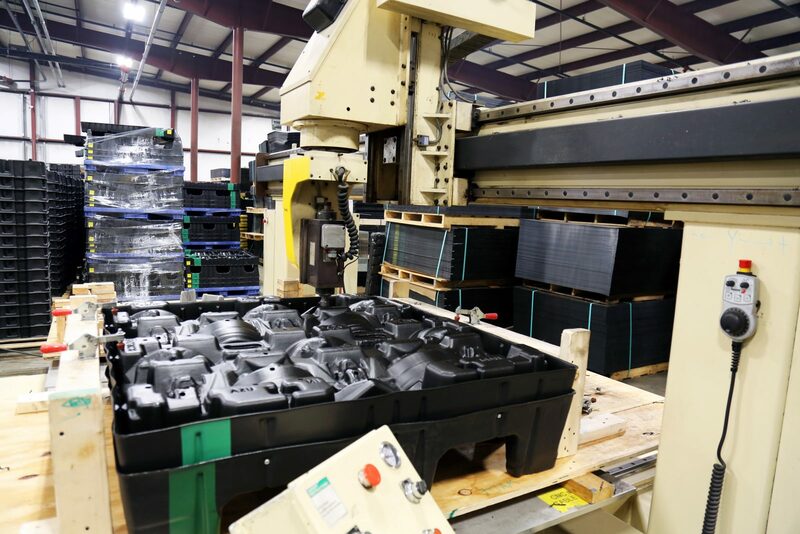 Vantage Plastics differentiates from other companies within the industry because we are truly a “custom” thermoforming company. We work closely with our customers to design and develop exactly what they need, no matter what the solution entails. We have created packaging and dunnage for everything from tiny solenoids to axle assemblies, from cheese trays to egg pallets, from seat cushions to entire automotive seat frames, and many other products in the consumer market. Anything you need to ship or store, we can create a package for it. We understand each customer has their own unique set of needs and we are here to accommodate it.